We worked with Tanner Furniture. ​I recommended working closely with a vendor who can assist you with designs and planning if you are making major changes to your space. Phases in the Plan. Phase One, Two, Three AND then Phase Four. The first main focus of our project to open the entrance to the library and lead directly into a leisure reading area in the Fiction section of the main library and the high-top table area. The Second Phase was the library classroom furniture and Collaboration Seating Flexible Seating Area where students can work on group projects and utilize the mobile projection screens to share resources or present. The Third Phase was the reception desk area, this was helpful to completely update the look and feel as well as the function of our space. 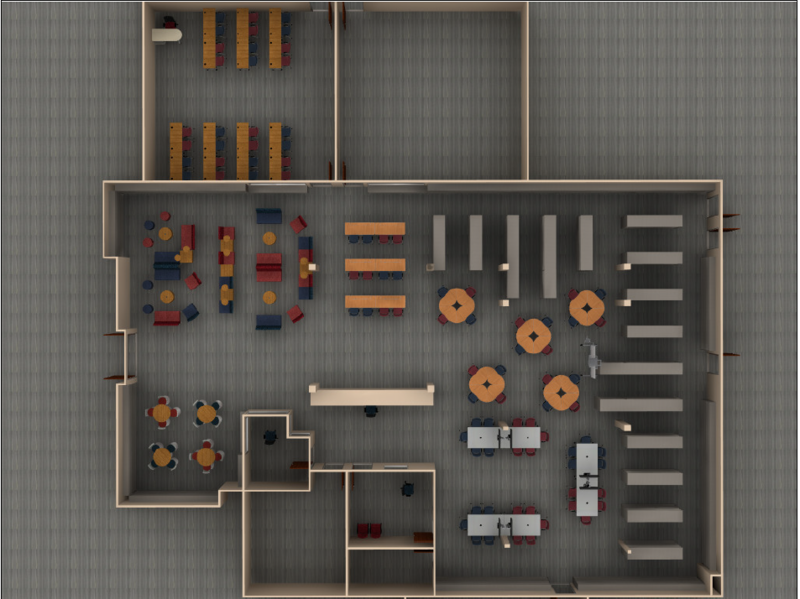 Phase Four would be envisioned later as we added the Makerspace to a small office space near the circulation desk. The design planning took several months and several meetings with Tanner. We selected furniture, had plans drawn up, selected different furniture ​and different colors. I also looked at other libraries and their designs, change our minds, checked pricing, changed our minds, finally made some choices of what to purchase based on available funding. Saved the ideas of other areas for other funding options. My plan for the CVHS Library had multiple funding sources and therefore I needed to be flexible with the phases of the plan. I purchased what I could as funds were made available but I started with the whole project in mind. It also allowed me to know what and how much to ask for when funding became available. Tanner was knowledgeable about what furniture would fit in my space and the options from various vendors. They really listened to what I wanted the space to become. Final Designs with Phase One and Two for purchasing.